YOUR MAMAS NOTES: Your Mama has previously arranged engagements this afternoon that we can not bail on or reschedule. However, before we hightail it down to the OK Corral for a life-affirming cocktail or three we thought we'd pass along a little quasi-celebrity real estate tidbit that arrived yesterday via covert communique from Fred Fink, a kindly tipster down in the Lonestar State. 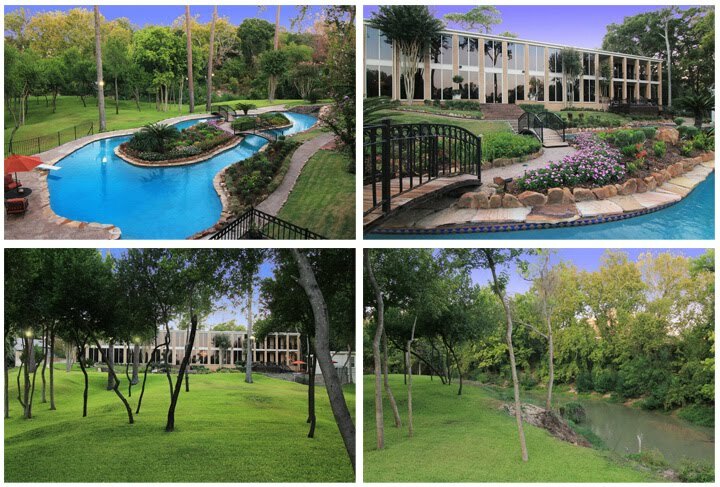 Mister Fink, bless his big ol' cowboy-booted Texan heart, kindly forwarded current listing information for a modern mansion in Houston, TX that looks disturbingly like an upscale country club, Holiday Inn, or squat suburban office building done in a half-baked Brutalist style. Mister Fink whispered to Your Mama that the eye-popping pile, listed at $3,499,000, belongs to Tina Knowles, otherwise known as the beloved momma to big bootified pop music super nova Beyoncé. Miss Tina–as her cadre of assistants are reportedly instructed to call her–works her stuff out as the creative force behind the ready-to-wear label House of Dereon as well as the "couture" designer of many red carpet gowns worn by Beyoncé and stage costumes worn by Sasha Fierce. 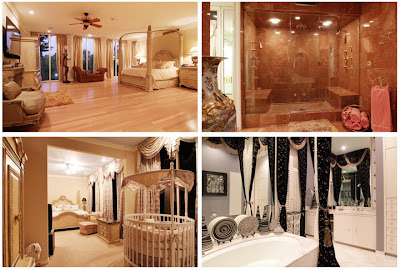 A quick gander at publicly available property records confirms the colossal cubic crib has been owned by Celestine Knowles since October 2004. It looks to Your Mama like Momma Knowles' superstar daughter Beyoncé actually coughed up the $1,596,000 to purchase the property earlier in 2004 and later transferred it into the elder Miz Knowles' name. Your Mama assumes Miss Tina's husband, record label executive and former Destiny's Child manager Matthew Knowles, also occupied the premises...at least until 2009 when Mise filed for divorce after it was revealed Daddy Knowles fathered a love child with another woman. We have no idea if Momma and Daddy Knowles remain coupled or separated but online reports indicate the divorce was called off in late 2010 because neither party showed up at the appointed time and the presiding judge dismissed the case. Anyhoo, listing information for the 2.6 acre estate, located behind the guarded gate of the fancy Farnham Park enclave in the affluent Piney Point Village area due west of downtown Houston (TX), shows the rectilinear residence was built in 1973 and encompasses 8,885 square feet. Listing information also shows the horizontally-inclined flat-roofed mansion contains five bedrooms and 5 full and 2 half bathrooms. A circular drive passes under a soaring porte cochere melodramatically held aloft by eight thick columns. Glass and wood front doors open into an almost freakishly long entrance hall with matching staircases at either end. The entrance hall spills into the cavernous, multilevel, hotel lobby-like formal living and dining room that listing information shows measures 50-foot long and 31-foot wide. 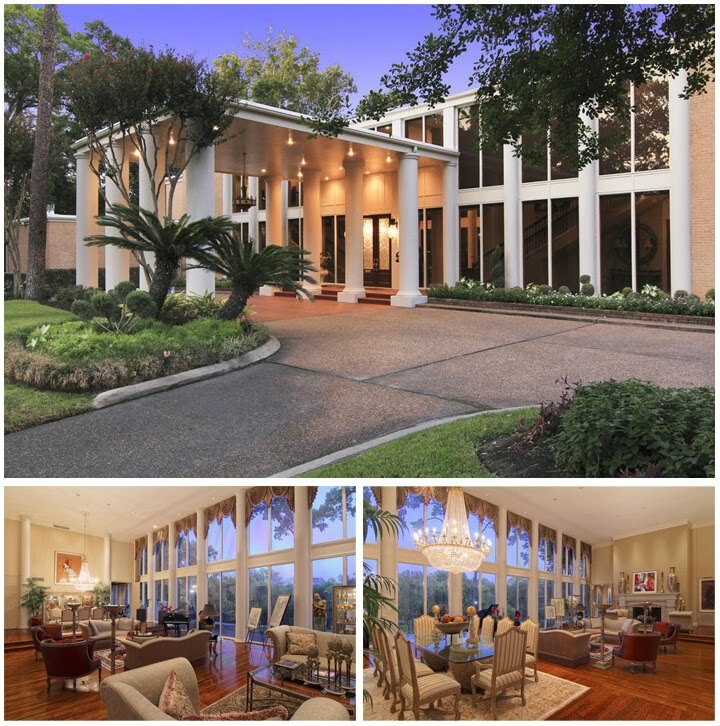 There are gleaming wood floors underfoot, a double height ceiling overhead, walls lined with half-round pilasters, a massive carved stone fireplace that anchors one end of the room, and a 50-foot long wall of floor-to-ceiling windows that look out over the swimming pool, rolling lawns, and surrounding thicket of woods. 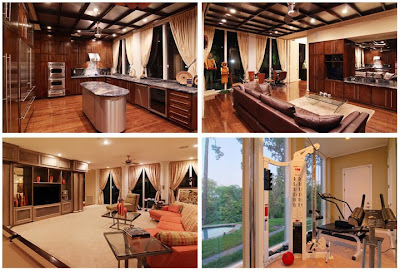 The less formal areas of the Knowles Krib include a center-island kitchen with contemporary finishes and stainless steel accents, an adjoining den/family room, 600-plus square foot media room, game room, and a wee work out room on the ground floor jam-packed with torturous-looking body improvement machines. Two of the five bedrooms are situated, as per marketing materials, on the ground floor while the other three are upstairs. Listing photos show one bedroom has an adjoining room set up as a nursery and listing information reveals that the "lavish" second floor master suite features a fireplace, private study, coffee bar, and dual marble and mirror bathrooms. A detached guest/pool house provides additional sleep over space for guests who might be loud snorers, gas passers and/or vocal fornicators. The office park vibe of the property kicks into high gear at the back of the house, comprised of a vast, double-stacked row of smoked glass windows that extend from the ground the the roof's edge. A couple of inset porches and balconies do little to break up the extreme architectural monotony of the rear façade.. The landscape tumbles and rolls down to the bright aqua blue lagoon-style swimming pool. For a reason we can not fathom a giant landscaped island, connected to the surrounding stone terrace by a pair of matching arched bridges, was placed right in the center of the swimming pool. An tree-dotted expanse of lawn undulates wildly and magnificently beyond the swimming pool and entertainment terraces towards a creeks that cuts through the wooded ravine that provides privacy for the property. Since we're a bit short of time today Your Mama is not even going to attempt to parse or try to make sense of the faux-opulent day-core. To each his or her own decorative taste, of course, but suffice to say that all the curio cabinets, ceiling fans and smoked glass windows festooned with swagged drapery make Your Mama need a big fat nerve pill. And the glitzy Suburu-sized chandelier over the dining table? Have mercy, hunnies. That riotous thing looks like it could have been ripped right out of the ballroom of an outdated Hilton Hotel or one of deposed dictator Colonel Qaddafi's too-garish palaces in Tripoli. We'd have a giggle and a chuckle about how kooky and campy it all is except we suspect that someone is or was very damn serious about the furnishings and florid decorative details, which Your Mama thinks might have been meant mix timeless elegance with modern sophistication. Property records reveal that Miss Tina owns at least two other properties in the Houston area including a modest ranch residence she and the mister bought in late 1997 for $98,637 and a 4,783 square foot lakefront house in a gated community in the upscale Houston suburb of Missouri City that was acquired in July 2000 for $314,250. Miz Knowles also owns, since 2005, an high-floor condo crib at the One Beacon Court building in Midtown Manhattan that as of November 2011 was on the market with an asking price of $5,600,000. For exceedingly high profile people who get snapped by the paps on a daily basis, Miss Tina's superstar daughter Beyoncé and her frequently retiring rapper hubby Jay-Z manage to keep their real estate doings on the down low. In addition to whatever ownership she may (or may not) still claim to the Houston house her momma Miss Tina just tossed on to the market, property records show Beyoncé owns three adjacent high floor condos in an ocean front complex in Miami Beach (FL) a mile or two north of the glitz and glam of South Beach. There are many online reports that suggest the power pair spent $7,600,000 to acquire an 8,132 square foot waterfront mock-Med mansion on Miami's über-swank Indian Creek Island in the fall of 2007 but publicly available records for the property we peeped don't really reflect that and, besides, even if they did buy the estate in question it was sold again in March 2010 for $9,300,000 to a non-celebrity. At one point Beyoncé owned an apartment in the high-gloss One Beacon Court building in Midtown Manhattan but, honestly pets, we're not sure of the status of that residence. In September 2004 Mister Z dropped $6,850,000 for an unfinished 8,309 square foot duplex penthouse atop the same fancy TriBeCa building where Skinny Girl Margarita mogul Bethenny Frankel recently dumped close to $10,000,000 on a pair of adjacent units. Beyoncé and Jay-Z got married in the penthouse back in 2008 and property records show Mister Z still owns the penthouse pad that includes 3,000 square feet of terraces. In May 2008 the then not yet wedded couple were widely reported to have purchased a recently completed 15,000 square mansion in Scarsdale, NY but, once again, we don't know nuthin' about the alleged acquisition and at this point Your Mama is unable to confirm the purchase with property records. Damn if that doesn't look like the porte cochere at some Sheraton Hotel (name of airport here). Truly fugly. There was so much hope when late 20th Century Conference Center chic was first proposed at the Homebuilders Association meeting. Toll Bros. & KB Homes never fell for the proposal, but a smaller builder outside of Houston put everything he had into the idea. His plans for a Levittown of conference center chic, CCC, were dashed after the spec house failed to sell anywhere close to asking. Fast forward to 2011, our builder's last known whereabouts are unknown, but rumor has it he's got a thriving business building megachurches in Atlanta. Back to the "house." 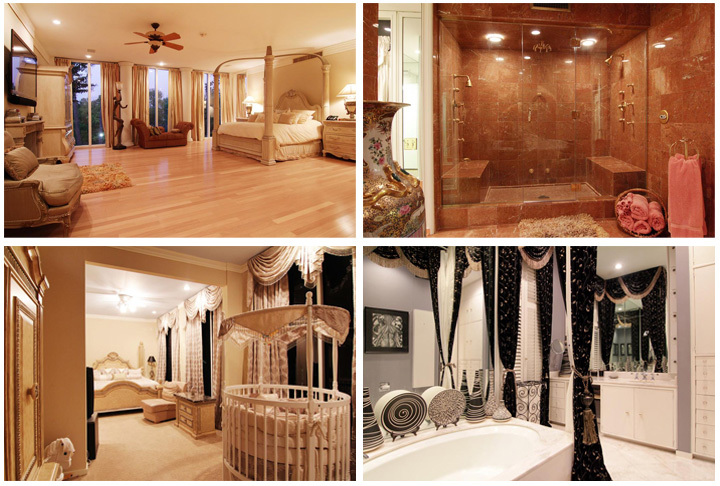 The curtains, the pool "island," the bowling alley bedroom, the chandelier big enough to hide Kenneth Lay, that urn in the bathroom, oh my. Is the crib for the love child? Sir John Soane after a leucotomy and a ride in type Tardis. This could not be worse. so, um...well, is this THE house of dereon???? Perhaps someone can purchase it and convert it into a posh hotel. ...ride in the the Tardis.... Sorry for the typo but not for the criticism. Did this place ever have fuel pumps out front? A house like this in L.A. would be over $10 million. That's a house? I thought it was a resort and conference center. What an unwelcoming visage. @LadyJ LMAO at "the chandelier big enough to hide Kenneth Lay." Brava! Just something about the place. I bow to you Lady J. That was quite good! Can't wait to her your assessment of the Crystal Cathedral in foreclosure. "Just WHAT do you mean there is no valet parking?!!?" Awful pictures. I can't tell much about the house except I don't like it much. I typically appreciate pavilion-style architecture, but this residence is a bit too commercial looking. It resembles old school El Dorado Country Club near Palm Springs. Where's the white line across the driveway that will prevent shopping carts from leaving the property? FARNHAM Park, cupcake. Not "Fornham". Nobody does tacky like Texas. I quite like it, particularly the exterior back side with the amazing succession of big windows. Unique. Stunning. And cheap too, as someone pointed out, compared to Los Angeles. My only worry would be a flat roof in the rain, but I presume she can afford to keep it in water tight shape. Is that an electric heater of some sort right beside the bathtub? Aren't electricity and bathtubs a dangerous combo? Or have I misunderstood the situation? Kids getting rich of their parents, I can tolerate. Parents getting rich off their kids? Nauseates me. And when they appear in their kids' commercials, well, I just wanna open a vein. So vain. The front entrance does look like a Holiday inn!